The practical way to explain data analytics is to compare the process to diamond mining. Diamonds are invaluable, but you have to work through many layers before you can get to the nuggets you are looking for. This is where data mining gets its name from.1 Data mining and analytics are skills many people mistakenly think they have because they know how to collect data. However, data collection and data analysis are too vastly different skills. Below are the basics of data analysis, as well as three different types of data analysis you can use in your business. What is the analysis of data? The world is drowning in data. Apparently, 2.5 quintillion bytes of it is being created every day, but in the case of data, more does not necessarily mean better.4 It’s what you can do with data that is important. Getting the most out of your data is also about knowing how to choose the right data analysis method. Process the unstructured textual information collected from the web, database or files. Extract meaningful numerical indices through natural language processing or pattern recognition. Further process the information by making it available to statistical and machine learning algorithms. An example of text analytics is when a company like Facebook, examines text written by customers after providing feedback on a certain product or service. Facebook will request customers to provide feedback in certain instances such as; when deleting an ad showing on their page, after purchasing items via a Facebook ad, or even when deactivating their Facebook account.6 The Data Analysts would then relay that information to the appropriate departments who will take practical action based on what can be learned from the data. This form of data analysis leverages software to convert data into actionable information, which can be used to inform strategic business decisions. 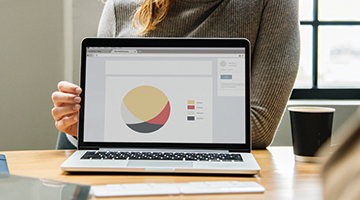 Business intelligence software analyses the collected data sets and presents them in the form of graphs, reports, charts, maps, or dashboards. Michael Gorman, Professor of Operations Management and Decision Science at the University of Dayton, described business intelligence like this: “It doesn’t tell you what to do; it tells you what was and what is”.7 Therefore, business intelligence is used to examine data to understand trends, derive insights, and develop targeted promotions. This is essentially a way of presenting data as images, using statistics, pivot tables, and other tools to present the data in an understandable and approachable manner. Data visualisation also allows for decision makers to view analytics in a digestible way so they can grasp difficult concepts or patterns. It doesn’t tell you what to do; it tells you what was and what is. The overall process of finding anomalies and patterns in data to predict outcomes can be exploratory and descriptive, or in-depth and specialised. By utilising one or a number of data analysis methods, the information gathered can be used to significantly cut back on business costs, increase revenue, and reduce risk. 1 Corsair’s Publishing. (2018). ‘Analytics — A Diamond Analogy’. Retrieved from Medium. 2 Richards, L. (Apr, 2005). ‘Handling qualitative data: A practical guide’. Retrieved from Google Scholar. 3 Shapiro, J. (2018). ‘Help Your Team Understand What Data Is and Isn’t Good For’. Retrieved from Harvard Business Review. 4 Marr, B. (2018). ‘How Much Data Do We Create Every Day? The Mind-Blowing Stats Everyone Should Read’. Retrieved from Forbes. 5 Reinhart, A. (May, 2015). ‘Choosing the Right Data to Analyze’. Retrieved from TDWI. 6 Claburn, T. (Jun, 2018). ‘Facebook tells users to report crappy customer service from advertisers’. Retrieved from The Register. 7 Pratt, M.K. (Sep, 2017). ‘What is BI? Business intelligence strategies and solutions’. Retrieved from CIO. 8 Hill, K. (Feb, 2012). ‘How Target Figured Out A Teen Girl Was Pregnant Before Her Father Did’. Retrieved from Forbes. 9 Krasser, A. (June, 2016). ‘How brands like Netflix and Spotify use data visualisation for social campaigns’. Retrieved from Clickz.